The black line in the graph above represents the "McCree Curve", which gives a relative indication of how efficiently a plant uses the different colours in the light spectrum to photosynthesise with. 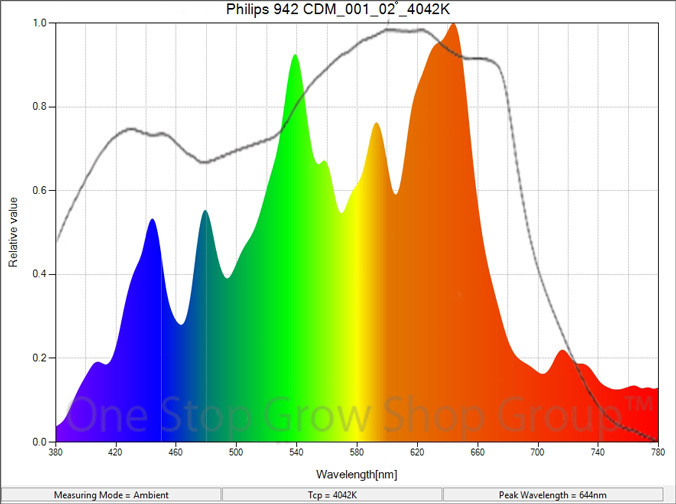 The perfect partner to the 315w Philips GreenPower 930 Elite Agro CDM Lamp, the Philips MasterColour 942 Daylight CDM Lamp has that extra blue light meaning internodes stay nice and tight, eliminating the issues with stretch that occur when using lighting with narrow, inadequate spectrums. Ceramic-discharge metal halide lamps to produce a light spectrum that's much broader than other forms of HID lighting (like standard metal halides and HPS). Its output is more comparable to the light produced by LEP (light emitting plasma) units. LEPs actually have a slightly broader spectrum than the CDM fixture, but they simply do not compare in terms of brightness. Hold with a clean cloth and screw the lamp into the bulb-holder fitting of your reflector until it will turn no further. It is important that the lamp is screwed very firmly into the holder. Failure to fit the lamp tightly will cause arcing inside the holder between the centre connector and the contact on the lamp. This will melt the solder contact on the lamp and irreparably damage it. Ensure the lamp is completely clean and free of dirt, grease and finger-prints etc. before switching it on. PLEASE NOTE: The 315w CDM lamps need to be bedded in as follows: on first illumination the lamp needs to be run continuously for a minimum of 15 minutes. This will allow the metals within the lamp to fuse correctly. FAILURE TO DO THIS WILL RESULT IN LAMP FAILURE! If the above is not adhered to, lamp warranty claims will be void. As with all lamps the light output they produce will decrease with use over time. One Stop Grow Shop recommends you replace your lamp regularly to maintain your garden efficiency.